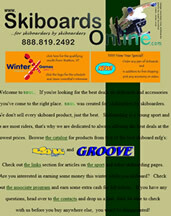 In August 1998 Skiboardsonline.com began selling the best skiboards you can buy. It was 1997 when the founder of SBOL, Greco, was walking down University ave. in Palo Alto, CA and spotted a Kneissel "Big Foot" video in the window of an inline skate shop. After two weekend rentals of 76cm Sporten Massos and 80cm Line Suns he was hooked and SBOL opened the following fall. Since 1998 Skiboardsonline.com has stayed loyal to what we feel are true skiboards: 110cm or less boards with wood cores and 4x4 inserts (130cm or less with wood cores and 4x10 inserts for longboard skiboards). We never will sell skis or snowboards.